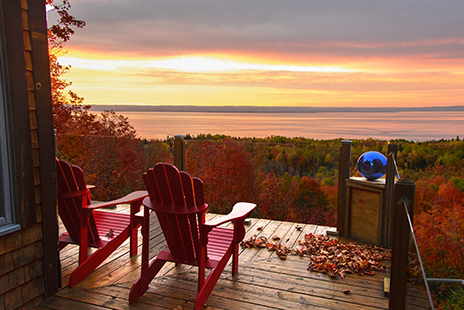 In the heart of Charlevoix, La Malbaie, Villas des Érables (2 cottages), classified 4 stars, can accommodate 6 to 8 people. Located on the mountainside with an area of almost 215, 000 square meters (53 acres) acres, our wooded land offers a spectacular view of the mighty St. Lawrence River as well as a private 1-km hiking trail. No construction or electric cables obstruct this dazzling view. You are not simply renting a 4 stars home but also a private 53 acres domain where you could explore all the activities that a mature forest can offer.